Go see tonight’s performance of Godspell at Weston High School! The Theater Company really outdid itself in this terrific ensemble-based production of the famous musical. My generation has not made things easy for this generation, and they are fully aware that they will bear a burden…. 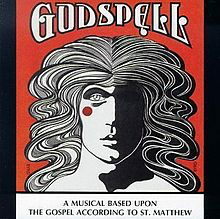 Godspell is a play about a disparate group of people coming together and forming community and also about the idea that the strongest and most active communities can grow from tragedy…. Before the show began, a slide show of news photos from Black Lives Matter, Parkland, and other recent instances of activism primarily by young people drove home the point. Since this was very much an ensemble production, I don’t want to single out any individual cast members. But I can’t resist mentioning the magnificent singing of Kayla Silverman and Grace Carter, who overwhelmed the audience with the quality of their performances. I also want to observe that there were many more than the typical one or two strong male voices (and sometimes fewer in your typical musical in high school): at least five or six did a great job, in addition to the usual complement of female voices. Three cheers for John Minigan’s final production as Weston High School’s theater director!